I sullied the weapon today with flat bars and yucky plastic canti brake levers, not to mention the crapola plastic Shimano friction thumbies (two lefts). I probably could've left the drops on it if I was prepared to go the hack on my left Doubletap; the overall throw was pretty close to right, and I suspect the trim position could've been shifted to line up with the 50t... but never mind that. 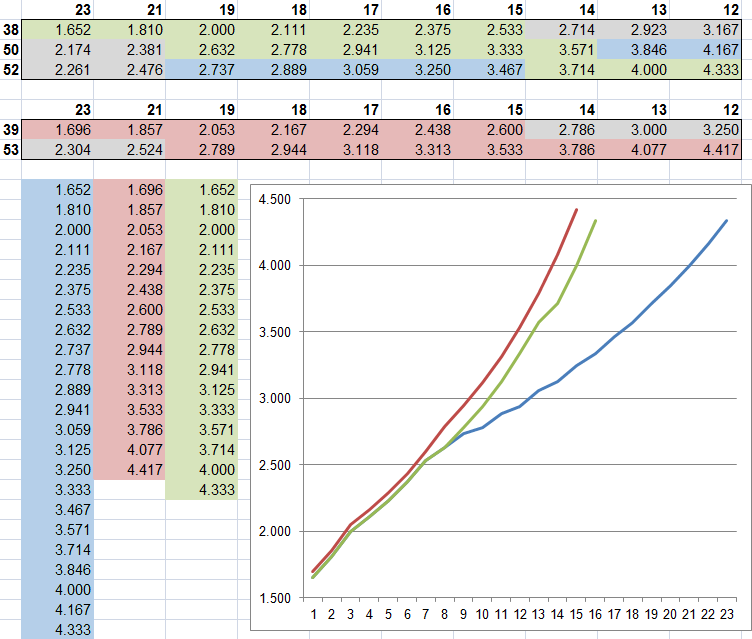 The blue numbers (which include the green) are the ratios of the half-step triple, the red numbers are a 53/39 on the same cassette for comparison, and the green is the half-step setup short-shifting. The X-axis on the graph is the gear number (not that that's a thing in the bike world - yet) and the Y-axis is the chainring/cog (multiply by tyre circumference for gear-inches or whathaveyou). Looking at a standard double, I saw a fair bit of room for jamming another ring in there, and even without doing horrible things to the chainline. The big rings are about 5.5mm c-c, about the same as 6s cogs. The 52t is outboard by pretty much its own thickness... I started filing the chain-catching pin down, and then realised it was redundant so just punched it out (there isn't room for the chain between the ring and the crank arm). The 38t is inboard 2.4mm. Rather than go to the horrific expense of buying spacers, and particularly since anything over 2.5mm tended to be the wrong sort, I bought a length of 14mm rod for a few bucks and got a mate to turn some up for me on his mini lathe. We could only scrape up a 9.5mm drillbit and I had my heart set on 9.9mm (nice and snug), but it turned out I have a rat-tail file that was perfect to finish the job. Now the packaging job on the front of the drivetrain is starting to look as impressive as the other end... moreso on a beefy carbon frame with little room to spare. There'd be some room to tighten this up a tad; although the gap between the 38t and the 50t is 0.5mm narrower than usual and they're inboard by a chainring's thickness, there's also a smaller diameter difference and the chain can reach the 8th cog on the 38t without catching the 50t, when I only need it to reach the seventh. A note on the ratios selected: these were chosen of course with my own preference in mind (I'm a light guy on fairly flat terrain) and in consideration of what's commonly available, but IIRC that nice flat curve I was able to obtain on the graph was a happy accident - as I recall (it was a few months ago now) there was nothing else in the generally obtainable range that gave as flat a spread. I'd be delighted if anybody feels like firing up Excel and proving me wrong, though. And the fact the FD here is hardly optimal can be compensated for by integrating overshifts into the code, and mitigated by phasing the shift with the crank angle. Front and rear shifts will be timed to coincide, using cadence and chain position info, by controlling the delay on front shifts following rear shifts. Last edited by Kimmo; 06-24-14 at 08:33 AM. 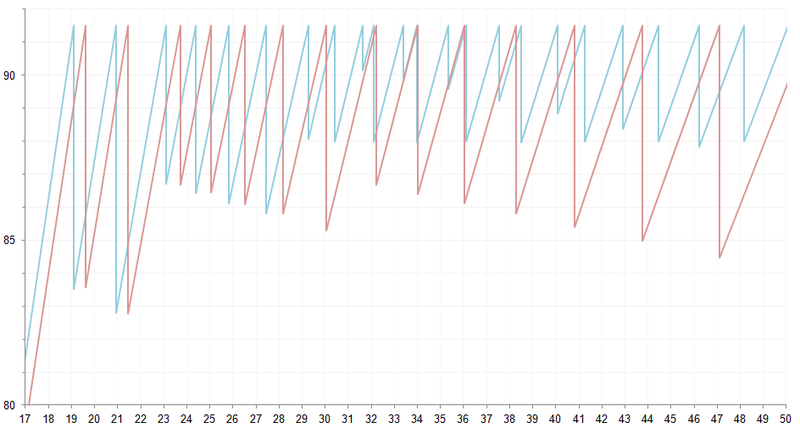 At some point gearing ratios can become too closely spaced. I'm thinking that half step 10-speed is it. Yea Half steps were 80's 6~7 speed .. my Touring bike shipped as a 48-44-28, back then .. But I'm glad you found something to keep you Busy for a while. obviously with the 130bcd all you can manage is a 38t.. to have it fit. 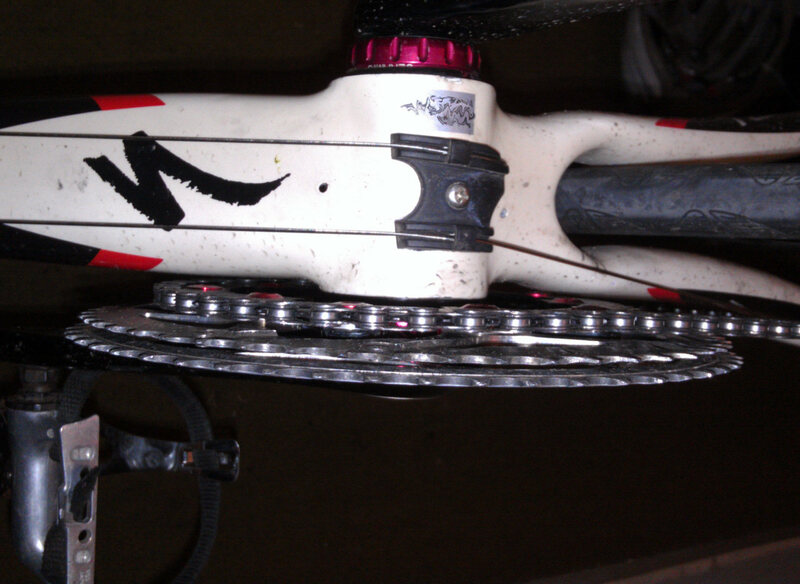 I'd put K-edge chain catcher on there to keep from dropping your chain. Dropped chains make ugly things happen, on Carbon chainstays. Last edited by fietsbob; 06-24-14 at 02:14 PM. My tourer is set up with a 20-40-44 front and an 11-13-16-19-23-28-34 cassette. 18 usable distinct gears. Wow! The concept of swatting a fly with a howitzer comes to mind. I've heard of agonizing over gear spacing but this is really overkill. The beauty of this system is that once he's done the agonizing up-front, the computer can shift sequentially through all of the combinations. I've sometimes wondered if this would have been the preferred direction if half-step had held on a little longer. Look at what the industry is doing to chase diminishing returns of efficiency. This here, this is the last big chunk of low-hanging fruit available. Mark my words - this will come to pass as standard stuff. If you think I'm being a little grandiose, consider that I predicted compact road frames in the 80s; I've always been ahead of the curve. I know what that sounds like, but for some reason this field of endeavour seems to be mostly populated with folks who have a hard time imagining that the design of the bike isn't finished yet. I'm not one of em. We shall see... I've never felt like my gears were too close; only that I don't have enough of them. I suspect anyone who time trials, or rides lazily (those most interested in efficiency) would agree. I'm both aggressive and lazy, so I have a particular interest in efficiency... It doesn't matter how many speeds; that's only about range. As long as we're talking half-inch pitch, the only way to get any closer than say, a corncob 6s, is to half-step. Or use abnormally large rings and cogs. 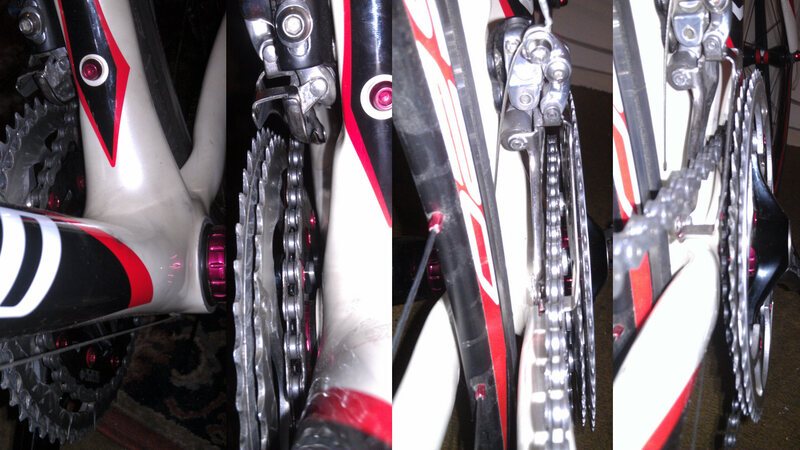 As for the chain catcher, I could put my RED one back on, using the SRAM FD's trick internally-threaded mounting bolt, but I think it's surplus to requirements - there's no room for the chain between rings and frame. Yeah, but it looks like a pretty rough spread to me, and you're not avoiding the problem I'm addressing here, ie bigger gaps between gears at higher speed. Also, you're talking some pretty fancy fingerwork to shift that sequentially. That chain would be dancing all over the place. The beauty of this system is that once he's done the agonizing up-front, the computer can shift sequentially through all of the combinations. Exactly. Except that I don't experience any agony dealing with ratios; I seem to understand that stuff better than most (I'm a whiz at stoichiometry). What's giving me a hard time is figuring out how to code interrupts in C++... plenty of agony there. I've sometimes wondered if this would have been the preferred direction if half-step had held on a little longer. Last edited by Kimmo; 06-25-14 at 04:14 AM. when the forces kick in..
conventional, sort of .. TA triple-isers replace the double's inner ring .. offer a 74bcd to go inside ..
like current trends have pushed..
Last edited by fietsbob; 06-25-14 at 07:58 AM. If you look my spread is 10% on the two big rings and the grandpa gear is a bailout for steep hills and a load. Be patient. shimano has a patent for a 14 speed cassette. 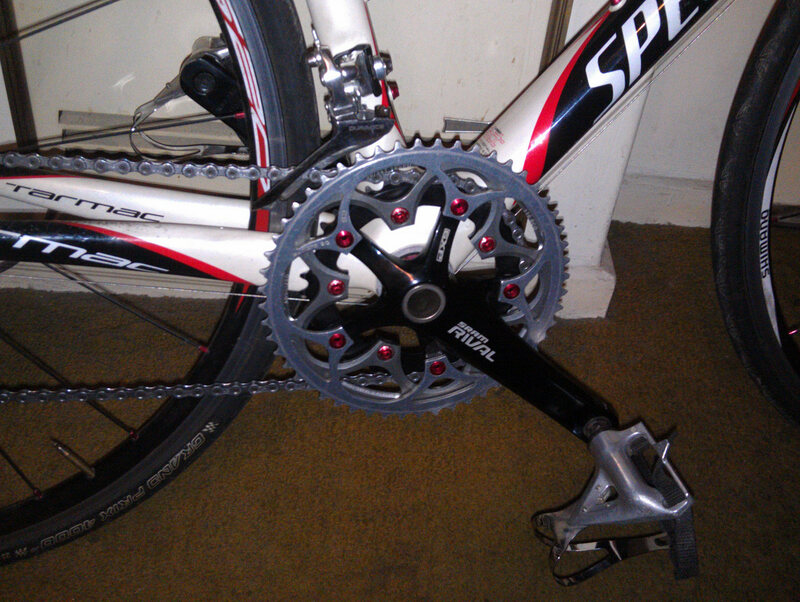 Or you could get a Sram three speed hub with an 11 speed cassette for 99 speeds. Patience is for those without the means to innovate for themselves. And I'm not interested in more cogs; more cogs and not enough rings is what got us into this steepening-ratio mess in the first place. More cogs isn't going to solve anything unless it's accompanied by a shorter pitch. And since the whole point of the exercise here is greater efficiency, IGHs need not apply. IMO the old half step with its double shifting went out with 10 speeds that we had before the middle 80s. With the 8 and 9 speed rear clusters and more, shifting has taken on a whole new aspect. Most of us just look at triples with 8 or 9 speed rear clusters as ------------up hill, level, and down hill. After picking the proper front chainring for the road at hand, we then just shift across the rear cluster for slight variations in the road. We no longer need to be slaves to half step with its double shifting. Life is now simpler, dont complicate it if you dont have to. Before you can hope to make the slightest dent in my enthusiasm for this concept, how about demonstrating that you grasp the mathematical and physical constraints that I'm railing against here. Do you spend much time trying to go fast in street clothes, while trying not to raise a sweat? More cogs has not given us ratios as close as those of us who fully grasp the concept of gear ratios might reasonably desire. The straight line of a corn cob cassette is actually a steepening curve, when you understand the ratios. And when you grasp the physics, you realise the curve is in the wrong direction. In the end the combination of competition and marketing will unearth this fact for all, to take someone else's* word for. * ie not some random dude on the internet extolling folks to figure it out for themselves, but glossy brochures and slick webpages and videos from trusted brand names. Last edited by Kimmo; 06-26-14 at 08:16 AM. Location: Very N and Very W Ohio Williams Co. Seems to me you are more or less building a CVT (constant velocity transmission)....which is a very hot topic in the automotive world, some of the same factors apply.....being able to optimize efficiency. Technology allows progress on ideas that have been around for as long as there have been machines. Memory tells me there was some work being done at one time on a chainring that could alter it's pitch dia on the fly ?? So my detractors and I just differ over the range of RPM we're prepared to tolerate... +/- 1.75RPM over 30km/h sounds pretty good to me. One way to think about the graph - how tall is the next step in a staircase, when the higher you go, the harder it is to climb. You kind of have to get on top of each gear as you shift up; I don't want to shift further, the higher I shift. Last edited by Kimmo; 06-26-14 at 09:01 AM. Well the beauty of it is (to me anyway) The electromechanics are the "hard" part, the user can decide what their goals are :-). The thing could be tied into GPS so all the rider has to do is thrash in the drops and is always in the gear they choose in advance for any section of a pre determined route :-).......and you could even have a "trim" that allows to back off or become more aggressive in that pre determined gearing. I like it. Tinkering is fun. Shimano Deore rear derailleur.......what is this I found?